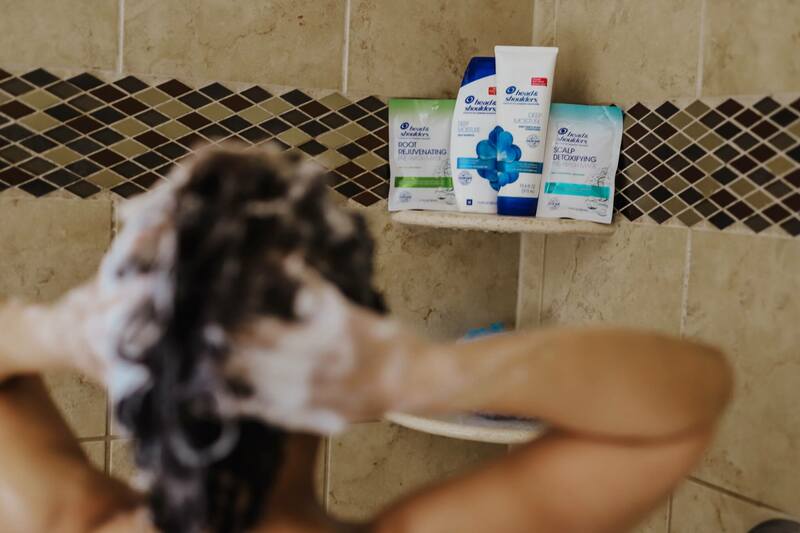 Great skin also includes having a healthy scalp, so make sure you treat it right with the Head & Shoulders Deep Moisture Collection and Pre-Wash Scalp Masks! 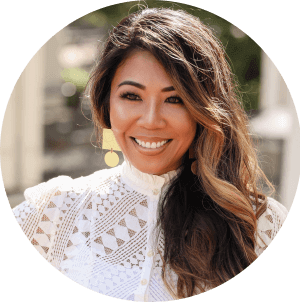 When it comes to skin care, we’ve been taught that the proper steps to healthy and glowing skin are to cleanse, tone, treat, moisturize, and protect. We’ve even gone the extra mile of going to spas to get facials and be pampered. But did you know that your scalp is skin too? All the effort you put into your daily skin care should also be put into your scalp care routine! As we go through the ups and downs of life, our skin is a pretty good indicator of how we are handling whatever life throws at us. For example, we sometimes break out when we’re going through life changes (hormonal, pregnancy, etc.) or when stress levels are at an all-time high. Similarly, the scalp lets us know if it’s not getting the proper attention or treatment. Hair coloring, changes of season, and stress are common causes of a dry scalp or irritation. Over time, our hair shows the effects of an irritated scalp when it’s dry and brittle, susceptible to breakage, or loses shine. While the skin is good about regenerating and repairing itself, a damaged scalp can result in hair damage. Being aware of the importance of scalp and hair care starts today so you can have healthy and vibrant hair in the future! This is where Head & Shoulders can help. I have long, coarse, and color-treated hair, and my scalp can get itchy and sensitive. With Head & Shoulders Deep Moisture Collection, the avocado oil helps address these issues by moisturizing my dry hair and soothing my irritated scalp, which is a welcome relief! I typically use a brand I purchase at a beauty supply store which costs much more, so when I tried Head & Shoulders for the first time, I was pleasantly surprised! I used to think of Head & Shoulders only as a treatment for dandruff. Don’t get me wrong; it still has anti-dandruff benefits. However, the products are also gentle enough for everyday use and provide moisturizing benefits! In addition to shampoos and conditioners, Head & Shoulders now has a new product offering, Pre-Wash Scalp Masks to be used twice a week before your scalp care routine. The Scalp Detoxifying Pre-Wash Mask deeply cleanses to remove impurities and refresh your scalp, with eucalyptus and mint, while the Root Rejuvenating Pre-Wash Mask stimulates your roots and cleanses to revive and bring back a healthy scalp, with tea tree essence and mint. These Pre-Wash Scalp Masks allow you to get a lot more from your traditional skin care routine. As mentioned, I use the Head & Shoulders Deep Moisture Collection, which has a mild scent of fresh fruit and elegant florals, reminding me of tropical smells (no medicine smells here!). The shampoo itself has a good lather and does a great job of keeping my hair and scalp feeling clean, refreshed, and non-greasy. The conditioner is thick and moisturizes my hair. Compared to the beauty supply store brands, it does a good job of moisturizing and did feel slightly heavy but had lots of body. The benefits of having excellent scalp care are unrivaled, and I happily recommend this to anyone with scalp issues. If you want beautiful hair, it’s essential to maintain it. It is beneficial to focus on scalp health, as it helps with a healthy foundation for your hair. Having the right shampoo and conditioner at a reasonable price, combined with pre-wash treatment offerings from Head & Shoulders, will help cleanse the roots, detoxify your scalp, restore balance, moisturize, neutralize skin, and soothe the scalp – like a great skin care regimen. You can get your hands on Head & Shoulders at Amazon or your local drug store. 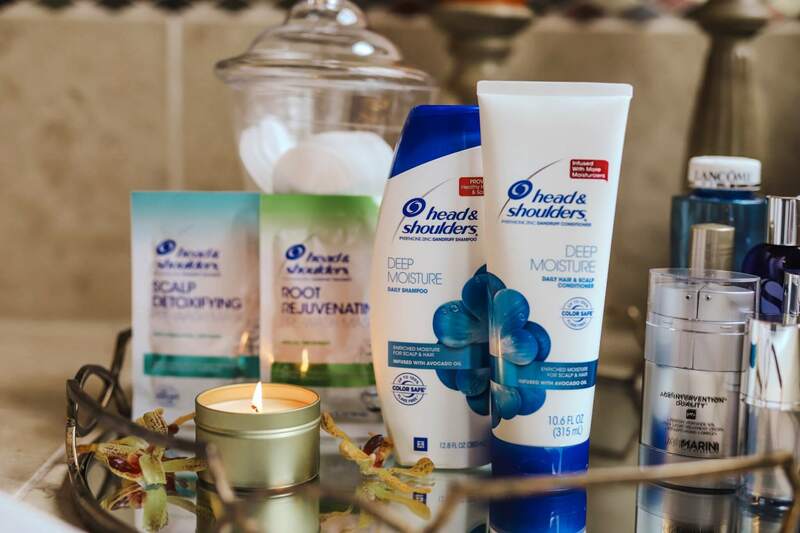 Check out Head & Shoulders to learn more about their collections based on your scalp and hair needs! As always, please consult a dermatologist, if your scalp continues to have severe itching or irritation. Next Post Emsculpt Review – Does It Work? Thanks for stopping by, Tia! I appreciate your taking time to read it! Yes, we tend to neglect our scalp! I’m excited about the upgrade in their conditioners containing more moisturizing benefits! Hope this helps with the hydration of your hair! This was so helpful for me. My hair and scalp are so dry right now. Can’t wait to try! Thank you! I think you’ll find this helpful! They also have the pre-wash mask you might want to try as well. Going to have to give this a try. Thanks! Hi Johnnie! Thanks for taking time to read! It’s a great preventative treatment to take care of our scalp! Definitely sounds like a great routine, and wow does Head & Shoulders smell amazing!! I’ll for sure check this out ???? Thanks Dana! They do have a great line of products for scalp care and do smell amazing. None of that medicinal smells! Great post! Thanks for sharing these helpful products from H&S. Scalp care is so important for healthy hair! Thanks for stopping by! You got that right – important to take care of our scalp before any irritation begins! A healthy scalp is so important for strong, healthy hair! You nailed it, Jennifer! We have to take care of our scalp like we would our facial skin care! I’ve heard great things about Head and Shoulders. It sounds like it works well for you. You have gorgeous hair! Thanks so much for stopping by, Kristie! It’s great to take care of our scalp like we would our facial skin! Love they have expanded their product offerings such as the pre wash masks. Good to see how they have broadened their products – I enjoy using them. Thank you for stopping by! Yes, they have added pre-wash masks to their lineup for that extra deep clean! H&S is a lifesaver !! IDK what i would do without their products! Hi Victoria! Yes, definitely a wonderful preventative and as a treatment product! I actually love using this brand for hair care once or twice a week. It’s hreat for feeing like your scalp is extra clean! Yes, and love they now have pre-wash masks for that deep clean! These have been forever present at our home. My husband loves these. Some things are around for a while for good reason, and this brand is one of them! Thanks for stopping by, Monika! I’m a fan of head and shoulders! It’s a great treatment for suree! They’re good for daily use now too (so good for preventative measures)!